According to the 1962 Missal of St. John XXIII the Extraordinary Form of the Roman Rite, today is the feast of St. Basil the Great. His feast in the Ordinary Form of the Roman Rite is celebrated on January 2. 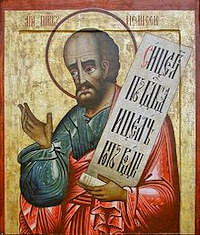 According to the Roman Martyrology today is the feast of the Old Testament Prophet, Elisha, the successor of Elias. His feast day is observed by the Carmelites who claim descent from Elias and Elisha who lived on Mount Carmel. He is also called Eliseus. Elisha, whose name in Hebrew means "God is Salvation," was the son of Shaphat. He was called by the prophet Elijah while plowing his father's fields. Elijah came and cast his mantle upon him, indicating thereby that Elisha was to succeed him. Before Elijah was taken up in a fiery chariot and into the whirlwind, Elisha asked to "inherit a double-portion" of Elijah's spirit. Throughout the whole course of his life the prophet, Elisha accomplished a significant number of miracles. He won the gratitude of the people of Jericho for healing its barren ground by adding salt to its waters. When the armies of Judah, Israel and Edom, then allied against Mesa, the Moabite king, were being tortured by drought in the Idumæan desert, Elisha consented to intervene. His double prediction regarding relief from drought and victory over the Moabites was fulfilled on the following morning (2 Kgs 3:4-24). JTo relieve the widow importuned by a hard creditor, Elisha so multiplied a little oil as to enable her, not only to pay her indebtedness, but to provide for her family needs (2 Kgs 4:1-7). To nourish the sons of the prophets pressed by famine, Elisha changed into wholesome food the pottage made from poisonous gourds (2 Kgs 4:38-41). During the military incursions of Syria into Israel, Elisha cured Naaman the Syrian of his leprosy by simply sending him word that he was to bathe in the Jordan seven times. At first reluctant, Naaman obeyed the Prophet, and after washed seven times in the Jordan, he was healed. Jesus referred to this when he said: "And there were many lepers in Israel in the time of Elisha the prophet: and none of them was cleansed but Naaman the Syrian" (Luke 4:27). Elisha's life and activities are found in 1 and 2 Kings and he is commemorated on this date in the 2004 Roman Martyrology. Read more about the Prophet Elisha here and here.